Juliana Bardolim (*1979 in Potsdam) is an author and independent art critic. She graduated from the Berlin University of Arts in 2003, where she majored in creative writing. She has been nominated a number of times for the Kleist Prize for young playwrights. 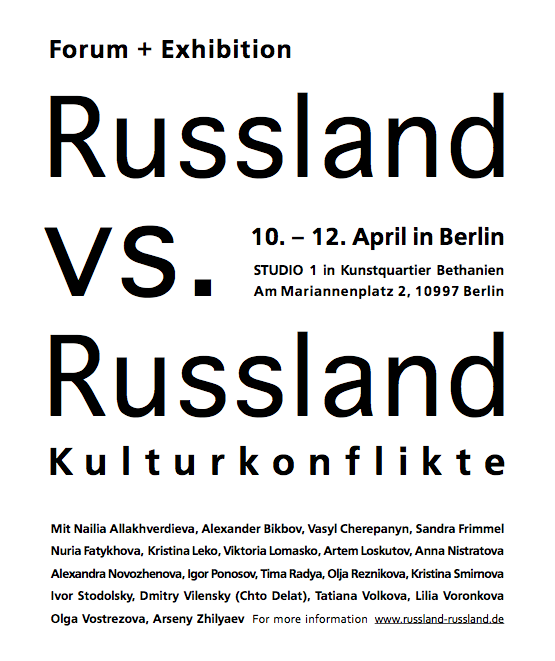 She has worked as an artist with Sergey Vorontsov, participated in the Fourth Moscow Biennale of Contemporary Art, in a series of exhibitions “Born in the USSR“ (Foreign Office, Berlin), “Quelles sont nos ruines?”, (Rennes, France), exhibition and award “Free Will” (Berlin), exhibition and award “European Ateliers“ (Moscow) and others. Since 2012 she has been the author of a number of articles on political art, activism and performance for art and culture magazines including ArtChronika, Artguide and Colta, conducting interviews with Christoph Tannert, Ellen Blumenstein, Artur Zmijevsky, members of Occupy Berlin Biennale movement, Juan A.Gaitan etc. She lives and works in Berlin.